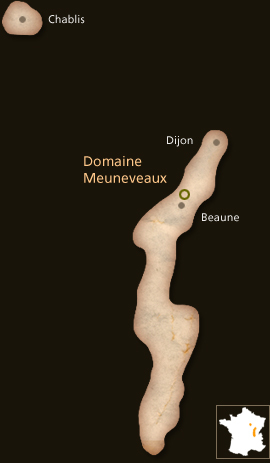 The Domaine is located in Aloxe-Corton, small village of the Côte de Beaune, in the heart of Burgundy. Located at the foot of the remarkable hill of Corton, the vineyard benefits from a rare exposure, going from the East, to South and South-West. Freddy spent seven years at the Lycée Viticole of Beaune. He obtained his professional baccalauréat with an internship at Domaine Bonneau du Martray in Pernand-Vergelesses. He then obtained a BTS in commerce with an internship at Bouchard Père et fils in 2004. In 2005 Freddy obtained a BTS in Viticulture & Enology followed by an internship at Domaine Henri Gouges in Nuits-St.-Georges. Afterwards he replaces for 6 months the vineyard manager of Domaine Rebourseau in Gevrey-Chambertin. Then, during 3 years, he worked as a winemaker at Domaine Tollot Beault in Chorey- les-Beaune. He then moved to the USA, Oregon. He stayed there six months as an employee at Del Rio Vineyards. He joined the Family Estate in 2009. He will be an employee of the Domaine for 3 years before moving on January 1st, 2013, as manager of the Domaine. He works with his father to improve the quality of the Domaine’s wines. Freddy relies on recent productions techniques while keeping a traditional way. From a viticultural point of view, Freddy is vigilant about protecting the environment and doesn’t hesitate tilling his vineyards against weeds and the like (no herbicides and insecticides are used). Freddy also benefits from the good advices of his wife Daisy, a graduate oenologist from the faculty of Dijon. 90% of the wines are red though one of the two whites is the relatively rare Grand Cru Corton Blanc. Harvesting is done by hand with a sorting in the vineyards. The fruit is 100% destemmed and indigenous yeast is used during the fermentations which last for 15 to 21 days. It is followed by 1 or 2 days of heavy lees settling. The wine will then be transferred to cask by gravity (no pumps are used) where the élevage will last from 12 to 18 months depending on the level of the appellation. A pretty gleaming color with golden reflections. Great aromatic finesse with a good minerality. The palate is well balanced with crisp acidity, harmonious with hints of brioche, apricot and white peach, finishing with light spicy notes, cinnamon and dried fruits. Well balanced. A pretty wine with a nice concentration. Serving suggestions: To be served on crustaceans or fish in sauce. Delicious with homemade foie gras! You can also drink it alone as an aperitif. Viticulture: Trellis method is simple Guyot (6 to 7 buds per cane to keep the yield low and increase the quality). Total of about 9 000 vines per hectare. The vines are treated, by environmentally sound technologies; it is a balance between the traditional and new biological technologies, which allows to fertilize the soil, protect the plants and not to harm the ecology at the same time. Vinification: Manual harvesting. Sorting in the vineyard. Harvest treaded, then pressed. Racking of the must and settling in barrels. Fermentation in oak barrels. Clarification and maturation of the wine in French oak barrels for about 12 months. Bottled at the Domaine. Bottling happens between December and February depending on the vintage. Beautiful bright color. Balanced and supple wine with aromas of strawberryblackcurrant. Soft and pleasant on the palate with mineral notes and a beautiful harmony of tannins. Good finish. All in finesse. Serving suggestions: To be enjoyed on tails of braised beef, roasted poultry and grills. It will also accompany soft cheeses. Altitude: Between 200 and 250 meters on the plain side. Geology: A mixed of clay, limestone and sandy soil. Number of vine per hectare: 9000 The vines are treated, by environmentally sound technologies; it is a balance between the traditional and new biological technologies, which allows to fertilize the soil, protect the plants and not to harm the ecology at the same time. Vinifications Manual harvest. Sorting in the vineyard. Harvest 100% destemmed for better finesse. Regular punching and pumping. Fermentation in thermo-regulated tanks for about 20 days. Devatting and barreled in the cellars. Clarification and maturation in French oak barrels for about 12 months. 1/3 in new barrels. Bottled at the Domaine. A beautiful deep red color. Aromatic richness (raspberry and mulberry). Good mouthfeel. Well balanced and good volume on the palate. A very present structure, with persistent tannins. A very fine and elegant wine. Serving suggestions: To be tasted with roasted poultry, roast pork or braised in its juice. Not to mention that it also accompanies the cheeses of our terroirs. Altitude: Between 200 et 250 meters at the foot of the hillside of Corton. Viticulture Trellis method: simple Guyot (6 to7 buds per cane to keep the yield low and increase the quality) Number of vine per hectare: 9000 The vines are treated, by environmentally sound technologies; it is a balance between the traditional and new biological technologies, which allows to fertilize the soil, protect the plants and not to harm the ecology at the same time. A color of medium intensity. The bouquet is elegant, quite powerful, marked by a dominant of black currant & gooseberry. Supple and discreetly tannic, slightly acidic, it is well balanced with a good structure. Serving suggestions: To be tasted with white meats or roasted poultry. It will also go well with light cheese. Number of vine per hectare: 9000. The vines are treated, by environmentally sound technologies; it is a balance between the traditional and new biological technologies, which allows to fertilize. Vinification: Manual harvest. Sorting in the vineyard. Harvest 100% destemmed for better finesse. Regular punching and pumping. Fermentation in thermo-regulated tanks for about 20 days. Devatting and barreled in the cellars. Clarification and maturation in French oak barrels for about 12 months and one third happens in new barrels. Bottled at the Domaine. Bottling between December and February depending on the vintage. Altitude: Between 250 and 300 meters at mid-slope. Geology: Clay and limestone soil. Average vine age: 30 years. The vines are treated, by environmentally sound technologies; it is a balance between the traditional and new biological technologies, which allows to fertilize the soil, protect the plants and not to harm the ecology at the same time. Very beautiful dark red color. A very fragrant bouquet with scents of strawberry and blackberry. Well balanced and ample on the palate with round tannins, bright red fruits and superb focus and minerality towards the finish. Good length. Generous and opulent. Serving suggestions: To enjoy with a salmis of guinea fowl, hazelnut of deer or a filet of beef in crust. It will be great also with the cheeses of our terroirs (époisses, soumaintrain, brillat savarin, or a cheese of the Abbey of Cîteaux). Altitude: Between 300 and 330 meters at mid-hill. Average vine age: 37 years. Varietal composition: 100% Pinot Noir. Beautiful deep ruby red color. It has a very refined bouquet with dark red fruit aromas (cherry and cassis). Good amplitude on the palate that is vibrant with great tension and round tannins. Solid structure with a good acidity. A racy and generous wine that gives a succulent and convincing finish. Several years of aging in the cellar will reward the connoisseur. Serving suggestions: Will go well with salmis of guinea fowl, duck with orange or filet of charolais in crust. It will be great also with the cheeses of our terroirs (époisses, soumaintain, brillat savarin, or a cheese of the Abbey of Cîteaux). Altitude: Between 300 and 350 meters at mid-hill.